It's amazing to think I have come this far in my life and never read a Hulk comic. As a child I was a massive fan of the big green machine. I was in awe of him as he was everything I was told you weren't meant to be. In my first year of primary school I had some...'social' issues. I don't know why I didn't integrate well with others. It may have been because I was an only child, it may have been that mum and dad didn't have any friends who had children...or for that matter, family! My cousins were all much older, so how was I meant to adjust to being put in a room with bunch of kids my age with NO experience of this whatsoever? At first my behavior was seen as a mixture of shyness and fear. Until one day in my first year when I cracked. So for years I breathed and counted to 10, bottling it up. But then this guy was on my screen! This jade giant of epic proportions! The cartoon on FOX KIDS was fantastic, showing him ripping up everything in sight. The old TV show would sometimes pop up when I was round at my nan's and I'd be convinced Lou Ferrigno was a puppet made by the Jim Henson company. There was no way a real man could look like that. Then as time has passed I've watched whatever has come out. The terrible 'HULK' of 2003, the fairly decent 'Incredible Hulk' of 2008, the highly entertaining Avengers films and the brilliant 'PLANET HULK' of 2010. And this year I was thrilled to see HULK and THOR were to team up for the 'Ragnarok' film. I also got the opportunity to interview the man himself, Lou Ferrigno, at Wales Comic Con [below]. I don't know if it was because of all this HULK goodness that my Talk Nerdy comrade, Chris Wakefield, spotted me eyeballing his copy of 'WORLD WAR HULK' and went and bought it me for my birthday. I put off reading it until nearer 'Ragnarok', thinking it would get me pumped up for the awesome HULK-filled goodness that was to come. Instead of getting my world breaker, I got a dream breaker. This is the follow up to 'PLANET HULK', a fantastically strong story mixing 'Lost in Space', 'Star Trek' and 'Planet of the Apes' with overtones of a tragic greek play. You were thrown into a whole new world alongside the green goliath, and had to discover it on your own. The HULK is not a chatty man so it would have been easy to get pages and pages of exposition, in it's place however, is brilliantly woven story telling. All the characters, be they friend or foe, leave an indelible mark on you. You care about them, their plight and the HULK. It was on this basis that I badly needed to see the next chapter of this story. I almost now wish I hadn't. On top of the amateur hour artwork, we have moments in the story that just don't make sense. Iron Man points out that Doctor Strange could stop all this with a click of his fingers. Stephen argues back that HULK would just destroy wherever he sent him away to and he would just probably come back anyway, even stronger. To that I say, YOU'RE THE SORCERER SUPREME! Freeze him in time until you know what to do with him then! Put him and his team in a hypnotic trance, a place where they THINK they're committing these acts of war until you can think of how to take him down. Also what humans would be so pro-HULK that they would ignore the terrible atrocities and world threatening acts he was committing and that they would rather stay around and gather to cheer him on? Signs and all. How convenient was it for HULK and his team to find some humans in the area willing to testify specifically against our heroes, and with such venom as well? And why on earth did the army think it could attack the hulk after all the heroes of earth failed? They don't do it as an honourable last act of defense. Ross and his team do it with all the usual bravado of an NRA member alone in his room, standing naked in front of the mirror sliding his gun in and out of its holster. That may be a great depiction of Ross and his men however, I don't think they're that blindsided that they would think they could take out this version of the HULK. The thing that hurts most about this story for me though is the HULK himself. I wasn't on his side at any point during the book, which is insane! By all means I should be able to see his point of view, he's been betrayed, tossed asunder, had to build a whole new life and lost it all again by those that betrayed him in the first place. I should be very much in HULK's corner over this. 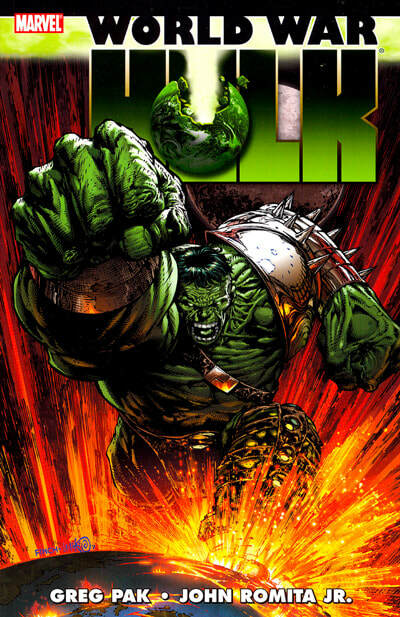 I think Pak wanted HULK to come across as scorned, vengeful and riddled with hate. Instead I just saw a spiteful, wicked monster. Most of all he came across as sad. I didn't see any honour in anything he did in this book. His allies who I grew to love in 'PLANET HULK' all come off as petty and borderline evil, completely wiping away any real empathy or connection I had to them beforehand. Instead of pulling my hair out trying to pick a side, I very much find myself just wanting HULK to bog off and take his new family with him. Without spoiling anything, this book ends tries to end with a great battle, a twist and cliffhanger but none are implemented successfully. I closed this book feeling similar to how I felt after seeing Pirate of the Caribbean: Dead Man's Chest. I'd seen a side to a character that I didn't want to see. I've read up and found there's another book called 'World War Hulk: Front Line' which interlocks in to the story, but my view is that if anything in there was important to understanding this story, it should have been contained in this book too. Altogether I found this book full of bad art, poor interpretations of characters all badly thrown into a story that was wobbly at best. A few choice words of dialogue here and there maybe help you see inside the mind of the beast, but there are too many pages between these moments to really break any new ground. An overcharged, pathetic bully of HULK is not how I remember him and not how I choose to remember him. I still believe the HULK is great character and I am willing to dive into a few more books to give him that chance. For now though, I can tell you that this book has left me feeling disappointed. Disappointed and angry. And you wouldn't like it when I'm angry.